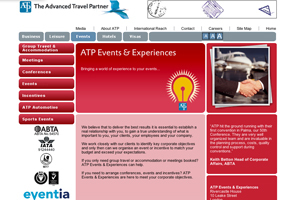 ATP Events and Experiences has recruited former Dobson White event directors Neil Pace and PJ Mitchell. Pace and Mitchell will lead ATP Events and Experiences' creative event operations in the UK. Their event management remit includes organising incentives, launches and conferences for ATP Events and Experiences' international clients. The 2012 Olympics will also be a major part of their work, as the agency, which is the events division of ATP International Group, is the official travel provider to the Dutch Olympic Committee and a number of sports federations. "PJ and I are excited to be joining ATP at this exciting time," said Pace. "To be growing the existing event business and spearheading our London 2012 programme is an opportunity that neither of us could refuse." Microsoft, Nissan Europe, Debenhams and Pfizer are among ATP Events and Experiences' European-based clients.